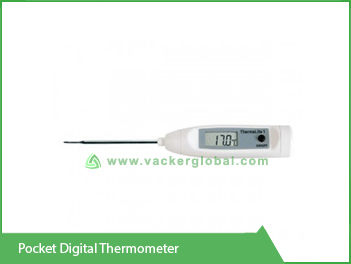 Vacker Saudi Arabia or KSA supplies Probe Thermometers which are devices that measure the temperature of food in Food Processing and HACCP. These are touch-type temperature thermometers. Trotec, Germany is the supplier for Vacker Saudi Arabia or KSA. We sell probe thermometers across Saudi Arabia or KSA to regions or areas such as Riyadh, Al Khobar, Dammam, Jeddah, etc. This has to be inserted inside the food so that temperature can be calculated. This is applicable in areas like food storage, food processing, etc. This is also known as Food Core Thermometer because it is inserted inside the core of the food for measurement of temperature. It derives its name based on synonyms like insertion thermometer, penetration thermometer and probe thermometer. The basic name for general use is food core thermometer. 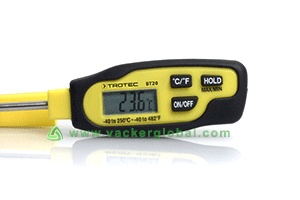 Vacker Saudi Arabia or KSA is a supplier of probe thermometers in Saudi Arabia. One model of insertion thermometer is BT20. Probe thermometer is of 40 grams weight only and can be handled in hand. It has 2 seconds response time which is considered as a good response time.